Lucky for you all I just happened to be super-extra behind in my voyager into Voyager which means this week I watched both Latent Image and Bride of Chaotica--two episodes that are totally fitting for Halloween. The Doctor stumbles into evidence that his memory and program have been tampered with. 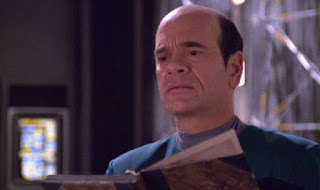 Upon closer inspection (and with help from Seven) he realizes it was the Captain and that the whole crew knows about it. So this one isn't really Trick-or-Treat scary. It's a psychological thriller with legitimate psychological and ethical questions being asked. The Doctor suffered an irreparable feed-back loop wherein his ethical and logical subroutines couldn't reconcile themselves with a choice he'd had to make. He was damaged and it seemed there was no way to fix him--they'd had to re-write his memory. And yet... is it what they should have done? Should they do it again? This one is dark and serious. It's almost a bottle episode with the exception of The Doctor's flashbacks so it also feels fairly claustrophobic. I love that it's Seven who ultimately comes to The Doctor's defense. I love that it's Janeway who sits up with him as he struggles through reliving his ethical dilemma. The Seven/Doctor/Janeway trifecta is a powerful one and it's already off to a wonderful start with Latent Image. It's a romp! Here Voyager accidentally makes contact with a photonic alien species who refuse to believe that biological lifeforms are a thing. 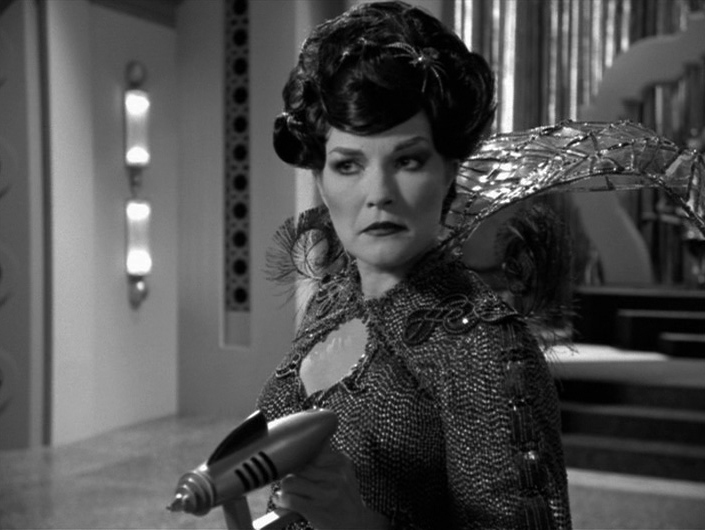 It's got all the zany antics of old timey sci fi serials and Kate Mulgrew does a perfect job chewing up the scenery in her fabulous Bride of Chaotica ensemble. If you're in the mood for some Voyager this weekend, settle in with your bowl of candy and your pumpkin beer and queue up Bride of Chaotica.